Home is on a hill. This is a four-bedroom, two bath complete remodel of a 1909 home. We were able to keep some of the original woodwork. We reconfigured the layout of the second floor and expanded the first-floor bathroom. 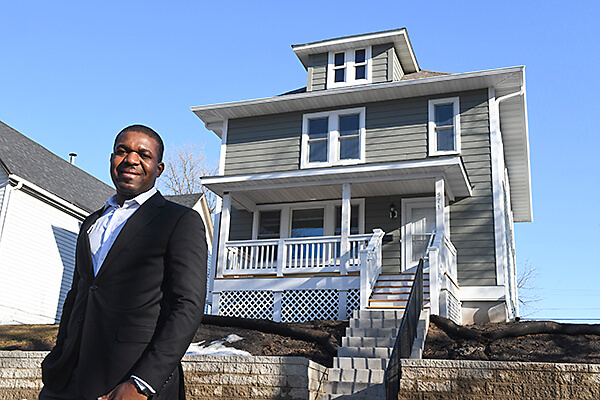 The home was acquired through the city of St. Paul as part of their Inspiring Communities program. With this program the home will be Green Communities certified. We overhauled the heating system to include new ductwork and a high efficiency furnace. We installed triple pane windows, high density insulation in the walls and installed an HRV (Heat Recovery Ventilator) system. The exterior is LP SmartSide siding, and we built a new two stall garage.